Genius at Work: Why Do Talent Programs Fail? Why Do Talent Programs Fail? I'm conducting research into what makes talent management programs effective, and what can be done to increase the accuracy of predictions made about 'high potentials'. As you might expect if you've read any of my books, the initial results are already fascinating and counter-intuitive. It seems that future potential has almost nothing to do with what you think constitutes a 'future leader', and is almost entirely dependent on something that I've been saying about high performers for the past 20 years - that the alignment between the individual and the organisational culture is almost all that matters. I've drawn up a visual representation of some of the things that I've noticed in 15 years of running 'hipo' talent and future leader programs. To offer some interpretation of this, what I consistently see within any group of named 'high potentials' is a top group of 20-30% who will fully engage with the process and achieve good outcomes in terms of career progression and role KPIs. At the other end of the scale is a bottom group of 20-30% who will not engage with the process and achieve unpredictable outcomes in terms of role KPIs, and almost never achieve career progression within the program. Remember that all of these people are actually identified by the organisation as 'high potentials'. One of the things we therefore have to understand is the definition of 'high potential', because we cannot predict the potential of anyone or anything, unless we are constraining that potential. The second interesting factor is the effect of telling someone that they are a 'high potential'. I've recently been talking to students at Aston University who are working on research to understand this effect. It's show in the diagram above as the 'spotlight', which I find polarises participants to move to either the top or bottom quartile. 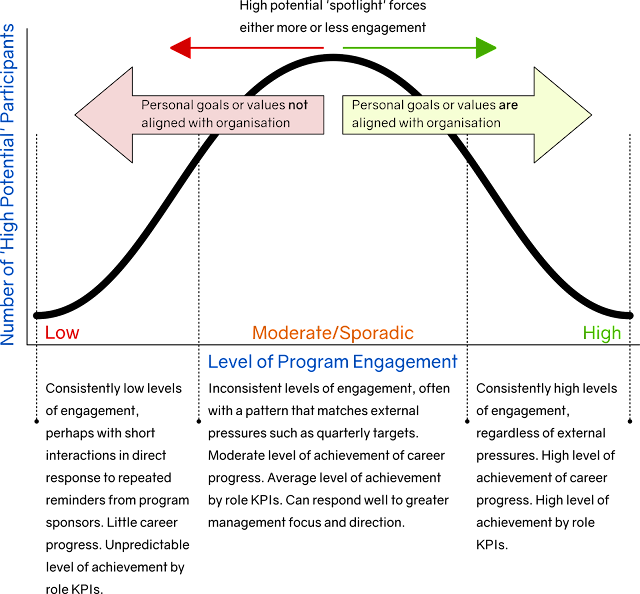 The greatest predictor of future performance in the talent program seems to be the alignment between the individual's own goals, interests or values with those of the organisation. Imagine that you get on a train, but you don't really know where the train is going. Based on the behaviour of other passengers, and the stations that the train passes through, you become increasingly confident that this is 'your' train, so you get a drink, relax, read a book, maybe even have a short sleep. Now imagine that you don't recognise the stations, some passengers reassure you that the train is going to your destination, but you just don't feel confident. Will you relax? How will you behave when the train approaches a station? Will you consider your options and wonder if you should switch trains? These two examples illustrate the effect of alignment on the engagement of a 'high potential' in a talent program, and the results that you can therefore expect from them.